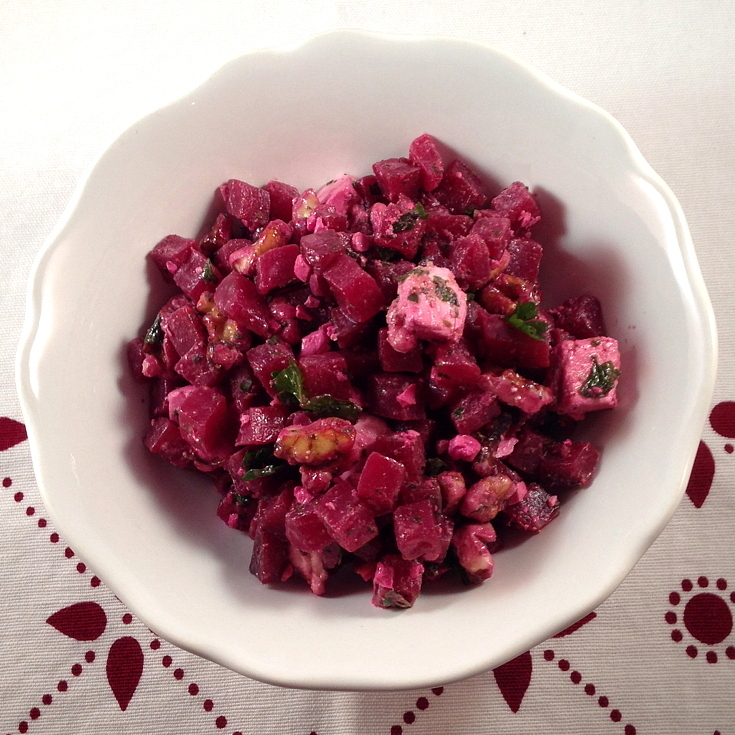 Beet Salad with Feta & Walnuts - Get the Good Stuff! Deeply flavorful, this salad starts with beets, cooked and chilled. Canned beets may be used if you prefer. This beet salad is perfect for using up any leftover beets you might have around – and it’s also good enough to be worth cooking beets and chilling them just for this dish. Like most composed salads, it is also flexible: substitute almonds for walnuts, add in some celery for crunch. Feel free to make it your own. This salad is all about the preparation. Cook and chill the beets ahead of time (or just use leftovers). Toast the walnut pieces if you like, but cool them before using. Finely mince garlic and chop some fresh herbs. Crumble feta. Once you have these ingredients ready, the salad will come together very quickly. I use a simple vinaigrette that’s been spiked with pomegranate molasses. Taste as you go: even more than most, this salad dressing needs to be balanced. Pour 2 to 2 1/2 tablespoons olive oil into a medium bowl. Add a scant tablespoon of red wine vinegar or lemon juice, and whisk madly. Now add in the garlic, minced very fine or pressed through a sieve, a pinch of salt, and a glug of pomegranate molasses. Add the chopped herbs. Whisk again. Taste the dressing, and keep tasting. When you think it’s balanced – that is, you can taste all the flavors but none of them jump up and grab your tongue – it’s ready. Add 1/2 cup walnut pieces (toast them lightly if you’d like to) and 1/2 cup feta cheese, crumbled. Mix gently with the dressing. Serve as is, or over butter lettuce for even more crunch. This makes enough to serve 4 as a side dish. I love beets and this salad looks delicious!